The story of Fine Art Shippers began with several reputable dealers in the Chelsea Antique Center, for whom we moved various Art Deco pieces and other antiques in 1995. Since then, our family-operated company has grown to become one of the most trusted and reliable fine art shipping companies in NYC. However, the process of moving antiques, no matter nationally or internationally, is still among the most favorite for our small team. Moreover, we do enjoy working with professional dealers and galleries, handling and moving antiques for them and their clients. Besides, there are so many incredible places in NYC offering truly exceptional pieces from different periods, and in this blog post, we want to tell you about one of them! Founded in 1989, David Duncan Antiques is now one of the leading destinations in NYC for antique furniture, lighting, and textile cushions. Its impressive collection features unique and rare pieces of 19th– and 20th-century European lighting, including exceptional light fixtures by Edward F. Caldwell & Co. and The Maison Baguès, French and Swedish neoclassical furniture, vintage cushions, decorative interior design pieces, and accessories for any taste. 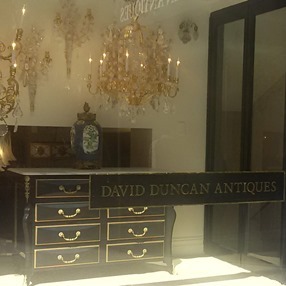 It is also worth noting that all the antiques offered at David Duncan Antiques come from estate auctions and European markets, so you do not need to worry about their provenance. Moving antiques of exceptional value is always a pleasure for Fine Art Shippers, and we would be happy to help you get any of them home!